Originating in the Middle Ages, this device was used in order to determine the right day on which to begin the fast in honour of the Virgin Mary. It was important for said fast to begin on the right day, and as there were six days in the year that could qualify because they were sacred to the Virgin, the devotee would consult the Sexton, who in turn would spin the wheel. By randomly grasping a marked thread as the wheel spun it could be discovered which day was the most appropriate for beginning the fast. The tower of St Mary's church > Link dates from the 14th century and the building has a large and attractive late medieval porch with a room above but the perhaps most noteworthy feature of the church is the Sexton's wheel. 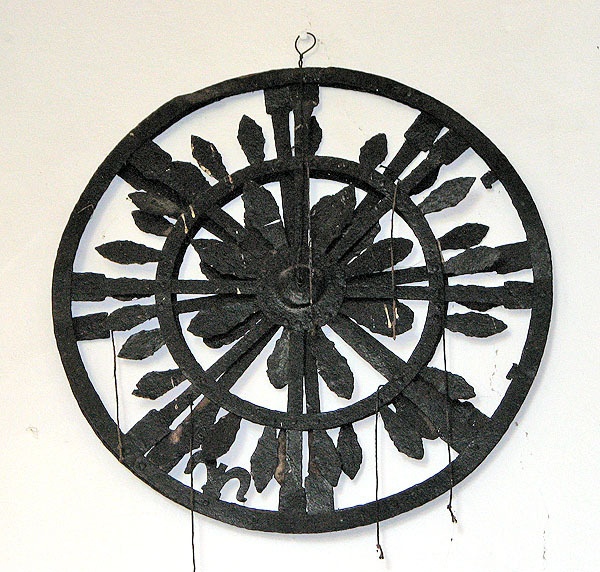 The church's greatest treasure is the Sexton's wheel, one of only two that have survived in East Anglia (the other one > Link is at nearby St Mary's churchin Long Stratton, Norfolk, about 15 kilometres distant). The 15th century rood screen is still in place albeit with its panels > Link much defaced. Above the chancel arch the remains of a doom painting can be seen, and the Jacobean pulpit > Link below is considered by many to be the best of its type in Suffolk. The east window contains stained glass > Link dating from several centuries, some of it medieval. It was installed in the late 1800s and came from a private collection.